Port of Los Angeles contemplates shifting where former World War II battleship is docked. SAN PEDRO — Plans to update the San Pedro waterfront could result in the slight relocation of a retired World War II era battleship, according to news reports. The battleship will still remain in San Pedro, but be docked elsewhere in the harbor to better accommodate other tourist and visitor-serving amenities, it was reported. Relocating USS Iowa, if it happens, elsewhere in the Port of Los Angeles would be the latest change in store with the nation’s busiest commercial harbor. The port district and city of Los Angeles have been working to revitalize the San Pedro waterfront for years now, with plans in play to bring new office spaces, shops, restaurants and other visitor-serving amenities to the harbor. News reports indicated a shift of where USS Iowa is docked would allow the Port of Los Angeles better accommodate increased cruise ship traffic. Several cruise lines operate out of the Port of Los Angeles. 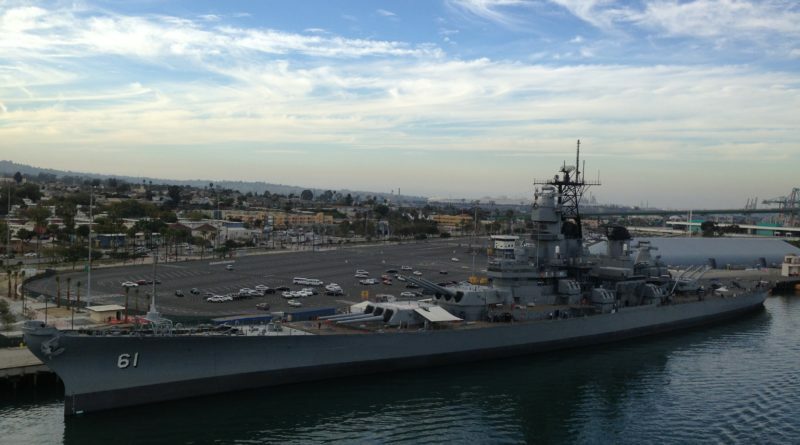 The idea of docking USS Iowa elsewhere within the Port of Los Angeles is reportedly being presented to local stakeholders at community meetings. Relocating USS Iowa – most likely near the planned San Pedro Public Market space – could reportedly cost as much as $16.5 million. How the port district would fund the relocation has not yet been determined. The district’s Harbor Commission will ultimately decide whether the relocation is feasible and could be funded. Of course the revitalization project has not been devoid of community pushback. A marina at the former Ports O’ Call Village was shut down and destroyed, as the land adjacent to where boaters once docked their boats will soon be home to the new San Pedro Public Market. A few restaurants in the area, such as Acapulco and Ports O’ Call Restaurant, have also been discontinued. Realization of the USS Iowa relocation and overall revitalization of the San Pedro waterfront is still years away, though updates on the project could be available as the calendar flips to 2019.